When you decide to embark on home remodeling, the cost is one of the most important factors to consider. Renovating your old kitchen can be quite costly and it may be the major reason why you have been putting off the project. The good news is that you do not have to continue making do with a kitchen that belongs in the last century. A little creativity and smart shopping strategies can help you to update your kitchen cost effectively. Following are some money saving pro tips that will help you to turn your kitchen renovation dreams into reality. When designing your new kitchen, think beyond the appearance and consider your lifestyle and your culinary needs. This will help you to save some money when shopping for fixtures and appliances. If you eat out more often that you cook at home, investing in a state-of-the-art multi-burner is more than you require. Think of how often you will use the space and determine whether you will need an eating space in the kitchen. If you have a large family or busy household, think about your needs when renovating the kitchen. Look out for appliance models that come with features that you will actually use. A look at kitchen design magazines and websites is enough to get your mind going in all different directions. Trying to choose the best design can be rather daunting owing to the wide range of options available. When shopping for your new kitchen, you need to do your homework so that you can get the items that you need without spending more than you can afford. When shopping for the large-ticket items, make sure that you find out the options available so that you choose those more suited to your budget. 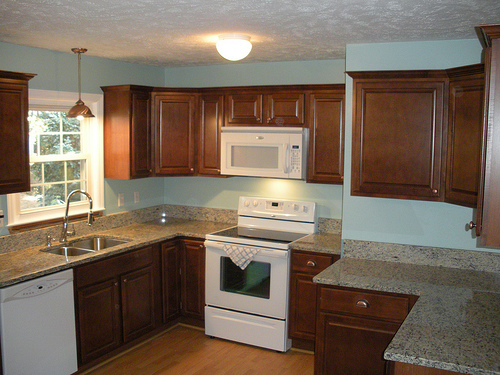 Saving on the cabinets and appliances will go a long way in making your project cost effective. As tempting as it might be, you should steer clear from professional appliances when shopping. The fact is that these appliances are very costly and chances are that unless you are a professional cook, you will not make the best use of them. You can get good quality and practical appliances at a fraction of the cost while still getting the look and functionality that you desire. The best thing is that most major home appliance manufacturers are coming up with new stylish appliances that will give you the pro look at the best price. The appliances are designed for home use and they come with advanced features. When it comes to choosing cabinetry, mixing some high and low cost items will help to create the perfect combination of form and function. You can get the look that you desire by pairing basic affordable cabinet boxes along with custom wood drawers and doors. You can also choose open shelving as a way to cut costs. You can find affordable and versatile storage units that can work perfectly with your modern kitchen. Talk to the designer about your needs and your budget so that you can get the best elements for your kitchen. Remember that plywood can be a beautiful and affordable option. Apart from cutting your cabinetry costs, you should look at other areas where you can make savings. Resist the temptation to splurge on a new extravagant countertop. The good news is that there are beautiful and well-functioning countertops available at affordable prices. Consider a blend of high and low materials. You can use costly materials like stone and wood sparingly, while using less expensive materials like laminates more extensively. By focusing the costly materials on specific parts of the workstation, you can get the look that you desire at a fraction of the cost. Dressing up the laminate countertop with wood edging will give you the perfect custom look. If you love the appearance of natural stone such as marble and granite, you can save costs by choosing tiles instead of the thicker slabs that are custom cut. The tiles are more affordable and they range in size from small mosaics to larger squares or rectangles. The tiles are available in a wide range of colors and patterns. Using stone tiles offers a versatile option for kitchen floors, counters and backsplashes. There are numerous mixing and matching options where you can use natural stone sparingly as borders or accents and less expensive materials on other surfaces. When it comes to the backsplash, you can let your imagination run wild. You do not have to spend much money to get the look that is perfect for your home. With some imagination, careful shopping, creativity and flexibility, you can design an affordable new kitchen. It is, however, a good idea to get professional services when it comes to implementing your remodeling ideas.